He is from Muel, a town of Zaragoza (Spain). He began his musical education in this town. Then passed to the Superior Conservatory of Music of Zaragoza, with Professor Amadeo Catala, with which one he will end his studies, earning honorable mention at the end of such studies. He has been part of the “Triple Horn” school of Madrid, where he studied with the soloists of the National Orchestra of Spain and the Spanish Radio Television Orchestra. 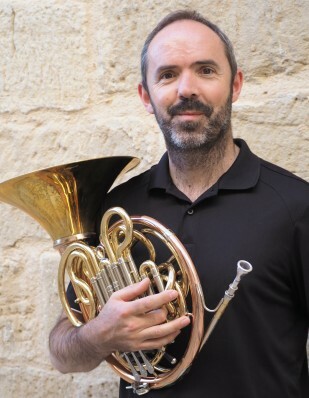 He has been a member during four years of the Youth Orchestra of the Basque Country (EGO), taking classes with the horn players Rodolfo Epelde and Will Sanders. He has collaborated, among others, the ONE, ORTVE, Community of Madrid Orchestra and Orchestra Pablo Sarasate (Navarra). He is also a member of Group Enigma Zaragoza Auditorium. In 2008 creates with the teachers of the conservatories of Alcaniz and Zaragoza, Pablo Castañé and Amadeo Catalathe “Horn International Academy Festival of Aragon” (HIAFA). Since then, are performed courses and concerts periodically, in which are involved horn players of high European level. Apart since two years ago are made exchanges with the Conservatories of Maastricht and Berlin.